Honiton & District Lions Club - Funding request ? The Members of Honiton and District Lions Club work "very hard" each year to raise funds in the district, mainly to assist the local community with requests made directly or indirectly to the club. In the Lions year Honiton and District Lions Club raise on average over £13,000 from the community, the Club also put back into the community over £11,500 to 30+ local groups, organisation’s, projects and people who benefitted from all the work of the Club during that 12 months. 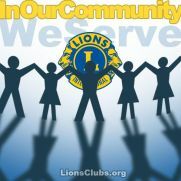 With other Lions clubs in the South West we assist with larger projects to which the area / zone agree to i.e. hospices / cancer care clinics / prostate care clinic etc, which benefit the population of the South West. And on such occasions, such as a local disaster, the flooding on the Somerset levels being an example (£47,000 raised), local Lions clubs and Lions International try to respond within hours with money and equipment, assisting the local club in the community. Lions internationally also have a number of projects which have run for many years such as the "first sight program", by conducting vision screenings, equipping hospitals and clinics, distributing medicine and raising awareness of eye disease. Making a request directly or to recommend assistance. The Lions "DO NOT" normally hand out cash, but try to assist youth, example, tall ships race / schools with large Easter eggs to raffle / senior citizens or families with household equipment etc, normally ranging from £50 to £2000 in value. We also assist with projects / events or supplying equipment etc ,all of which would make a great difference to any person or group. Giving us as much detail as possible and do not forget contact details so we can call or visit to discuss your request.